Why is it better to study in Japan? How is it different from studying hard in my own country? While studying in Japan, you will use Japanese 365 days per year! Your Japanese input/output volume will be immensely higher! While you may be able to learn Japanese in your own country, in that environment, the opportunities to hear and have actual conversations in Japanese will be overwhelmingly limited, and between classes while you are not using Japanese, you are likely to forget what you learned. On the other hand, if you live in Japan, besides attending classes you will be in direct contact with Japanese culture, and you will use Japanese naturally while shopping, at your part-time job, when meeting other students (both Japanese students as well as your fellow international students), and in nearly every aspect of your life. In Japan, everyday life will become your Japanese class. Japanese employers, whether in Japan or in your own country, welcome applicants who have "lived in Japan" and who are "knowledgeable about Japanese culture." If you are planning any kind of Japan-related career, then by all means, please come and experience it. How does FFLC differ from other Japanese schools? At FFLC, the number of class hours is higher (850 hours per year), and after completing 2 years you can receive as associate degree. For vocational schools, a minimum of 800 class hours per year has been stipulated, while for non-vocational Japanese schools, the minimum is 760 hours. 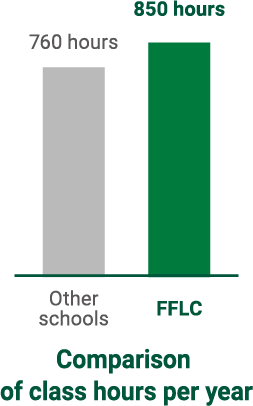 Comparing our 850 hours to 760 hours reveals that at FFLC, a student can accumulate up to 90 more class hours per year. This 90 hours may be considered roughly equivalent to 6 months of Japanese study in your home country (assuming 2-hour classes attended twice per week). Just as 4-year universities confer bachelor's degrees, vocational schools confer associate degrees. Students who complete 1700 hours of study over 2 years can receive an associate degree. How do you check and manage class attendance? Every day the attendance of each student is confirmed, and steps are taken so that attendance rates remain high. Can you list the companies where FFLC students began working when they graduated? Can I learn immediately practical skills that will give me an advantage in the workplace? Yes, you can. We have enlisted current business and industry professionals as instructors for a variety of classes, so you will master practical skills. What kinds of job-search guidance do you provide? ･ Coaching for speaking with employersFor International Students, FFLC teaches the basics of searching for employment in Japan, and provides assistance during the application process including coaching for interview preparation. For students in the International Career Course, periodic "suit days" are scheduled on which instructors strictly check the business wear and grooming of students. After these, students always have their business wear ready for interviews, and can approach even sudden interviews in a relaxed state of mind, without rushing. Working-visa specialists are available on campus as well, so students can conveniently inquire about necessary documents, how to prepare them, requirements and deadlines, and any other concerns. Finally, FFLC has enlisted the support of a visa-application professional to assist with challenging cases. Depending on the situation, a student may visit directly, or FFLC staff may contact the professional on behalf of the student. How should I search for employment? FFLC maintains connections with a multitude of employers, and through them furnishes employment opportunities to students. Job opportunities that arise are immediately conveyed to eligible students. If a student or students are interested, a coordinator at the College contacts the employer and negotiates a schedule for application screening and interviews. The details vary, and depending on the employer, interviews may take place at the College or at the employer's office. What is the BJT (Business Japanese Proficiency Test)? The BJT measures your ability to communicate proficiently in business situations, in Japanese. The Japanese proficiency that you demonstrate during interviews, for example, and on forms that you fill out for potential employers is vitally important. - Able to understand spoken Japanese accurately in meetings, negotiations, on the telephone, etc. - Somewhat able to understand spoken Japanese in meetings, negotiations, on the telephone, etc. - Largely able to comprehend everyday business documents, both internal and external to your organization. What kinds of instructors teach at FFLC? Our classes are taught by instructors with expertise in numerous and diverse fields, including mathematics and the physical sciences. Many have had lengthy careers in high school and postsecondary education, and some have 10 or more years of experience counseling students who continued their educations at universities/graduate schools. Do you provide guidance counseling for students who wish to continue their studies at a university or graduate school? Yes. Beginning with your homeroom instructor, the faculty will provide thorough guidance and support during the year prior to your graduation. Is there a system for recommending students/graduates? Yes. Within the "Designated School Recommendation" framework, we can recommend FFLC students and graduates who meet the requirements for attendance and grades/marks. EJU stands for "Examination for Japanese University Admission for International Students." This exam measures the degree to which you are likely to succeed in coursework at a university in Japan. EJU scores are an important factor in university admissions decisions. Make an effort to increase your scores in each exam section, and you will increase the likelihood of acceptance at the university you are aiming for. Subjects TestedYou may choose which exam sections to take depending on your major/specialty or on university application requirements. However, Humanities and Science subjects cannot be tested on the same date. Advice Class textbooks are written in Japanese, of course. However, an abundance of reference texts and listening materials in Chinese and other languages are available at the College, so please take full advantage of them. You will absorb more knowledge if you study material written in your native language as well as Japanese, and if you spend time preparing for classes and reviewing at home, so please do not neglect these. What is the JLPT (Japanese Language Proficiency Test)? The JLPT assesses the Japanese proficiency level of non-native speakers of Japanese who are studying to improve their level. The test is given in Fukuoka, Tokyo, Nagoya, Osaka and across Japan, as well as overseas in 62 countries. The test has 5 levels ranging from N5 (lowest) to N1 (highest). Your certification level will be an important factor in future university admissions and employment decisions. Do your best, and try to attain N2 or N1 certification! 1. Your total score must meet the minimum requirement for the test level that you took. 2. Your score for each of the parts, (a), (b) and (c), must meet the minimum requirement for that part. Able to understand the structure and content of passages on a wide variety of topics (such as newspaper and magazine articles), even ones containing abstraction or logical complexity. Able to understand deep or profound content in passages on a variety of topics, as well as the flow of discussion and the intended meaning of particular expressions. Able to understand the flow and content of conversations, lectures and news on a wide variety of topics, spoken at a natural speed, including the relationships among people mentioned. Able to understand the logical structure as well as the gist of the conversation/lecture/news. Able to understand passages on a wide variety of topics (such as newspaper and magazine articles) when the main points are clear. Able to understand the flow of discussion and the intended meaning of particular expressions when reading a typical passage. Able to understand the flow and content of conversations and news that cover topics extending beyond everyday life, spoken at nearly normal speed, including the relationships among people mentioned. Able to grasp the gist and outline of the conversation/news. Able to understand concretely written passages about everyday situations. Able to grasp the outlines of newspaper articles by reading headlines and main points. Able to grasp the outline of a somewhat difficult passage about an everyday situation if paraphrases are available to aid one's understanding. Able to understand most of the content in conversations encountered in everyday life, when spoken at somewhat less than normal speed, including the relationships among people mentioned. Able to understand sentences about everyday situations written with basic vocabulary and kanji. Able to understand most information in somewhat slowly-spoken speech that is encountered in everyday life. Able to understand words and simply-organized sentences written in hiragana and katakana as well as basic kanji that are used in everyday life. Able to glean necessary information from brief, slowly-spoken speech that is common in everyday life and the classroom.